Sittingbourne’s Steam Railway receives no external funding and relies upon ticket revenue, the Railway Shop, Away Sales and the Footplate Café to provide enough cash to keep the Railway operational each year. This money also pays for the maintenance of the Railway and, particularly, Milton Regis Viaduct, which has cost about £150,000 since the 1990s on a rolling programme of maintenance. Since the Railway was forced to close in 2008, an SOS (Save Our Steam railway or Save Our SKLR) Campaign was launched to secure the future of the line. This successful campaign has seen the Railway saved for future generations and the Railway fully reopened between Sittingbourne Viaduct and Kemsley Down in 2012, with the first full season being operated in 2013. The closure hit Sittingbourne Viaduct hard, the station area was churned up and damaged by the pipeline removal contractors and then the mill demolition contractors. Metal thieves removed items of track work. The buildings were repeatedly broken into and even lived in at one point and the perimeter fence damaged in multiple places – a very sorry sight. To enable reopening in 2012, a new footpath was laid between the ticket office and the platform and other improvements were beginning to be planned. The perimeter fence was repaired but will need replacing at a cost of £20,000. The main entrance gates and the rail gates have been replaced thanks to a donation from the executors of the late Tony Nokes. The staircase from the ground level to the station level was built in 1969 for the opening of the railway and had seen better days, but we were able to replace this in December 2015. 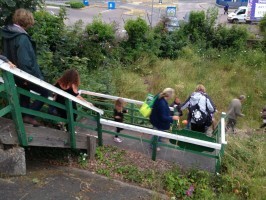 There are no disabled facilities at the station and a new access ramp will be required. This could cost us in the region of £20,000. Further vandalism occurred before we were able to secure the site and resulted in fire damage to both the staff mess room and the booking office. These have since been replaced by a steel container. Work has also been done to make the station more visible from adjacent roads and the retail park by the removal of bushes and undergrowth. We are indebted to Swale Borough Council who have given us grants towards the container and also for new signs to make the station more visible for passengers to find. The station desperately needs increased security fencing, CCTV coverage, replacement of the existing platform, a new second platform, a new ticket office building, a new waiting room building, toilets etc. – everything we need to bring the station up to modern standards and expectations. If we are going to make Sittingbourne Viaduct Station accessible, we will also have to make some improvements at Kemsley Down, including an upgrade or replacement of the toilet block to cope with disabled visitors and also baby change facilities. This is why we need your help, it is estimated that this work will cost in the region of £75,000, the Railway just can’t afford such additional outlay, so this is another SOS – this time let’s Sort Out Sittingbourne! Please make a regular or one-off donation at www.justgiving.com/sklr – if you are a UK taxpayer please also add Gift Aid as that will add even more to your donation! 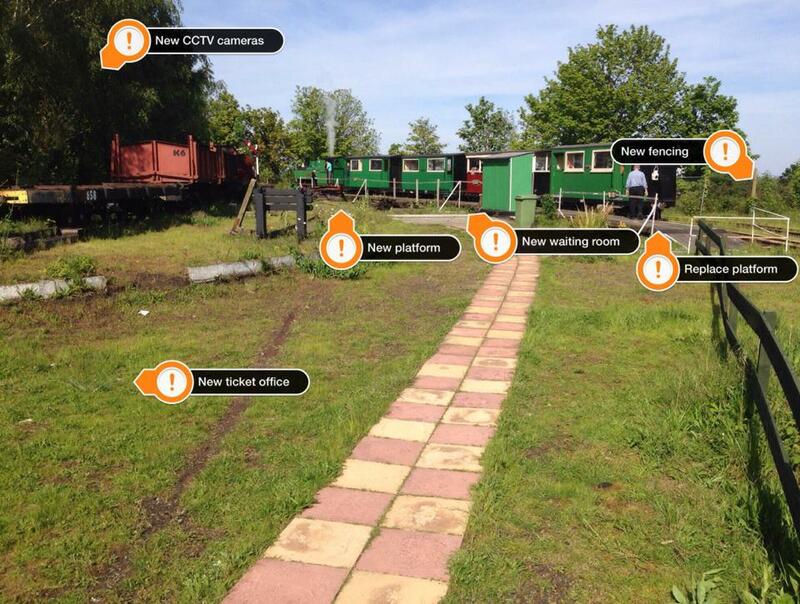 help us with the improvements to the Railway, perhaps you have something we can test for you! A range of corporate and individual fundraising opportunities such as ‘sponsor a fence panel’ or SOS branded gifts will be produced in due course. Over the coming weeks and months, this page will be updated with running totals raised so far and more information of the work being planned and, hopefully, being carried out. It’s not just your money we’re after – it’s your body too! The Railway’s band of active members needs bolstering to enable some of them to have time off, rather than being required to keep the Railway running, especially during August which has trains running 1-4pm every Wednesday and 11am-4pm every Sunday plus the bank holiday Monday – that’s a big ask of our volunteers. We can provide tools and training for operational and maintenance tasks. Sundays (and Wednesday’s in August) – during the operating season we need staff to operate the Railway as well as maintain it, you will often find the track gang busy at work on the line or at Kemsley Down – this can be quite hard work and a great workout! So that’s 14-15 volunteers every operating day. When trains start running at 1pm, we have a Staff Train from Sittingbourne Viaduct station at 10am. If you would like to offer your time for any of the roles listed above or have skills you think the Railway may benefit from, please email info@sklr.net and will find you something to do! It must be noted that only members can be working volunteers, see this page for more information.